1.) David, tell our readers a little about where you’re from or where you grew up… and how that influences the type of art you’ve found yourself making? I grew up in Lowell, MA when it was still very much a struggling old mill city, not the growing and striving community where I’m painting today. My mother was a registered nurse who would frequently worked long hours, while my father, a high school English teacher, would swing by 7-11 with me for comics on our way to Lowell General to wait for my mother to get off her shift. Occasionally, we would need to wait until after dark. I would dive into these great adventures of the Fantastic Four, Spider-Man, Batman, and the Invaders at the ages of 5 and 6. In fact, comic books were an important piece of how I learned to love reading. 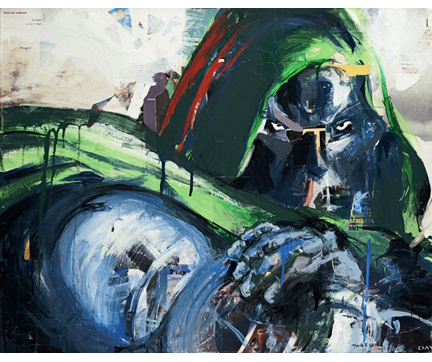 Over time, I experimented with many forms of visual art, but even as an Abstract Expressionist painter I knew that I had to get elements of the comic books I loved from when I was young into my work. I wanted my work to evolve into the large, bold, expressive, comic-book inspired canvases that I create today. And there’s still plenty to explore and examine as my paintings continue to evolve. 2.) Are there any specific locations here in New England that have had a profound meaning to you and your art? ie: Your schooling? A place of major inspiration or childhood memory? The old mill buildings of Lowell. One of my many childhood memories is of sweeping the floors at my grandfather’s shop, Garment Manufacturing. He owned the entire building that is now the Ayer Lofts in downtown Lowell. I loved the eeriness of high ceilings, old elevator, and loved the old, dark back hallways and stairwell. My imagination would take flight as I anticipated some monster or villain creaking around behind a door or Man-Bat hanging from the rafters. Yeah… They have really taken the magic out of the old mill buildings. 3.) David, there are unmistakable aspects of an "abstraction" fine artist’s approach to your work. 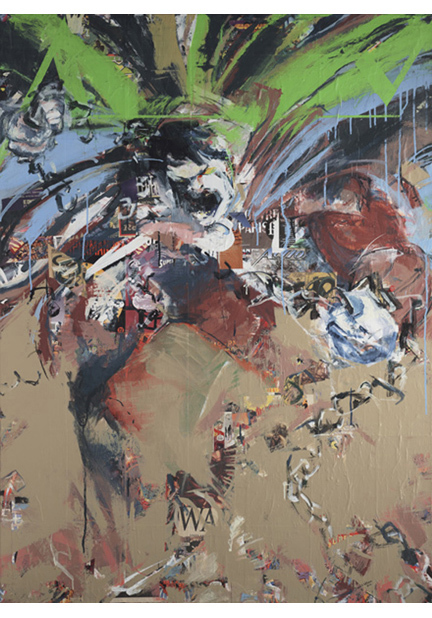 Your subject matter embraces comic book culture & pop art but is executed through influences of Jackson Pollock, Franz Kline and even Hans Hoffman. 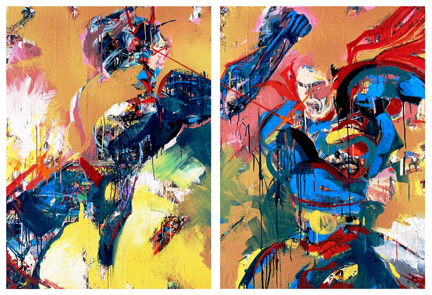 Tell us how a shared passion for abstraction and comic book culture have somehow merged together in your work. This is the heart is my artistic identity… The “Who am I?" I actually thought about it as, for a lack of a better word, my brand. What do I bring to the table that no one else is doing? The best way to accomplish that is to explore the dichotomy of two historically different forms of art that I love and want to corporate into what I do. I have this ongoing exploration of how to merge the elements of abstract and expressive painting with the Pop of comic books. But I knew it would be a long process as I had to gently balance things to build complex compositions through color and motion, especially from the comics end. My continuing fear is to prevent things from being “comicy” or silly, but painterly without taking things too seriously. I think it’s working out so far. 4.) Some of your earlier work is very much grounded in abstraction hence the moniker ‘Action Abstraction Studio’ located right in Western Ave Studios in Lowell. Yet, as more and more work comes out of your studio it's showing us some interesting representational pieces. Characters and figures are now emerging and coming into focus. You are still maintaining a very painterly approach but slowly moving away from pure "abstraction." Is this a natural progression for you or do you see yourself reinvestigating or revisiting working purely as an abstract artist again? Yes, it is a natural progression happening in front of our eyes, including mine. Now that I had evolved to the point in my work of being more figurative, I’m already working back to being more painterly in the last couple of months as I prepare for my show at the Chelmsford Center for the Arts. And quite honestly, I’m happier. The evolution from abstract to more figurative was directly influenced by working at comic cons, which I enjoy, however, I’m a painter. My work is strongest when the viewer only gets the impression that it was inspired by comic books. 5.) Tell us a little bit about your process; There’s a lot going into each piece from collage to drawing to various techniques of paint application. What’s the very first step for you when you settle in working on a new piece and where do you go from there? Very first thing is to cover the canvas with a collage of comic book covers and pieces of pages. Having that peeking through enhances the composition from the word “go”. It also serves as a general starting point for the placement of color and major lines and movement within the painting. With that done, large areas of negative space are painted in with large brushes to place figures. Then begins the process of layering paint and collage to build out the figures and details until it all comes together. 6.) During a normal workday, what’s the studio typically look like? Total disaster or super organized? Closer to total disaster… Not horrendous, and I can usually find what I want without tripping too many times… Next question. 7.) Any music while working? - Anything you’re listening to now that is pushing you or inspiring you? Always listening to anything upbeat… Music that keeps me moving… Love bands like Franz Ferdinand, Fitz and the Tantrums, Mighty, Mighty Bosstones, and Bastille to name a few. Don’t have silence. 8.) What medium or product is your sweet spot?? Even right down to the brand name, color, & materials. Found or purchased? Give our readers some industry secrets! Two things… Golden matte or semi-gloss soft gel acrylic medium is tops as an adhesive for collage. Fantastic! That and a 2 ½ or 3 inch house painting brush. Yes, I am low tech artist, and proud of it! 9.) What has been the most challenging part of building a career as a professional artist for you? ie: family, $$$, time, inspiration, space, networking, etc…. I’d be lying if I didn’t say money. It’s been a roller coaster ride, and the valleys are tough. However, when I’m selling we do very well. Time has also been an issue as the process can get away from me. As an example, I have had to learn how to speed up the collage process from selection of content to cutting to application. It can very easily become a plodding quagmire of inefficiency. 10.) Who was/is the most important person in your life guiding your direction as an artist? I have a friend at Western Ave Studios, who I can frequently talk to about art as a career and I can bounce ideas off of her. I know I will get frank, focused answers that will enforce and confirm what I already thinking, as well as, expand the possibilities of where a painting or career opportunity can go. That is the vital piece of being part of a vibrant community of artists like Western Ave. Studios in Lowell. 11.) Growing up in Lowell, MA it must feel incredibly fulfilling to have your own studio located right in downtown Lowell amongst the historically rich buildings and creatively thriving city. In just Lowell alone you’ve exhibited at The Loading Dock Gallery, The Brush Gallery, The ALL Gallery and even The Whistler House Museum. Did you ever foresee yourself becoming such an active member of the arts community in which you were raised? I’m proud to be part of the Western Ave. Studios community, and the Lowell artists’ community in general. I did not see this kind of opportunity growing up, but over time that changed. Lowell looked like a rundown mill town as I was growing up, and that only began to change in a major way after I finished high school and went off to study art at SMU (Southeastern Massachusetts University). I returned to a city that was making many changes for the better. 12.) Knowing ‘Action Abstraction’ is a tip of the cap to a certain iconic hero that is able to leap tall buildings with a single bound, are you partial to DC Comics over Marvel? Do you have a favorite? If you absolutely had to pick one over the other, which company has the characters you relate to the most? - Supes, Bats & Wonder Woman? 0R - Wolvie, Spidey & Iron Man? I don’t do the DC vs. Marvel thing so much. I personally focus on characters, actually teams that I enjoy, which are the big 2: Avengers and Justice League. There you can get all the high impact characters like Thor, Iron Man, Captain America, or Superman, Wonder Woman, and Batman in the same adventure. Big and bold… And that’s what I try to do as a painter with process, as opposed to content. 13.) Give our readers out there an artist right now you think they should know about. Who is absolutely killing it that you think would be a great fit for the next volume of Chroma? I would have to say, if I only have one choice, Ilene Richard, who is a fellow artist at Western Ave. Studios. Her stuff is bold and unique. She is really starting to move lately as she’s picked up a gallery and several shows this year. You’d be adding another woman to the roster and that’s a good thing, too. 14.) What’s next for you? Any future project, exhibition or client where people can see your work? Chroma doesn’t count!